Speaker cabinets are among our most sought after pieces. It makes sense because our shop shares a wall with Guitar Merchant. You can imagine the kind of requests we get from the random people who come by. So we made a few, finished them with tolex (that sturdy textured vinyl material) and sold them. Then folks started asking for unfinished cabs. These people are interested in experimenting with their own speaker cones and finishes. We're willing to accommodate and build whatever the customer is looking for. 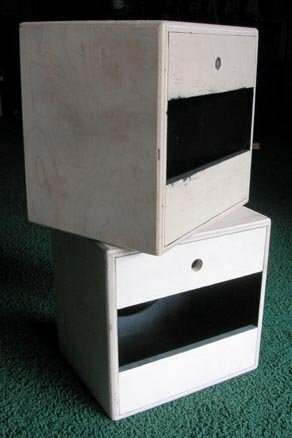 Our speaker cabinets are made of top quality birch plywood. The ones shown here are cut for a 12-inch open back speaker, which is the most popular size and design for guitar players. Of course we also make 10- and 8-inch cabs, though the outside box dimensions do not change. The front wood piece (with the hole) is dadoed into the sides adding a lot of structural strength. The back parts are screwed into place. These speakers are sold out and we have no plan to make more, though we can build to spec for local customers. 13 x 16 inches outside, rounded edges and corners, open back design, top quality birch plywood, flat black painted box interior, exterior unfinished. If you need a twin-12 or completely finished cab, let the guys at Guitar Merchant know when you call. If we don't have one in stock, we can make one up pretty quick. 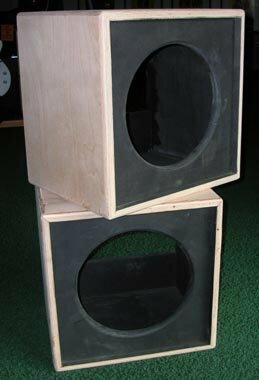 Also, we have recently hooked up with a speaker manufacturer (who we can't name just yet) and we'll soon be able to load these cabs with high-end drivers for a complete unit at a great price. If you are in the Los Angeles area, feel free to drop in and we can discuss building your own. Our custom work is done to order.